The City of Euclid was graciously awarded $50,000 to purchase a new wheelchair accessible transportation van used to shuttle seniors in our community to and from the Center, grocery shopping and to medical appointments. The van is also used to deliver meals to our homebound seniors. Thanks to Mobility Works, residents now ride in a safe, modern and comfortable vehicle which replaced an 11 year old, high mileage vehicle that was requiring extensive maintenance to keep running. This funding provided by the County served an immediate need in our community. 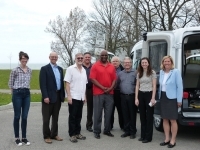 On Wednesday, May 2nd City of Euclid Officials, Cuyahoga County Department of Development Staff, Mobility Works Representatives and Senior Center members and administration celebrated the arrival of the new vehicle. Senior Center Program Manager Bob Payne introduced Mayor Holzheimer Gail who spoke about the importance of providing safe transportation to our seniors in order to keep them involved at the Center. Since the arrival of the new van, Senior Center members have been enjoying the new vehicle and its accessibility, a necessity to including all members of our senior population involved in activities and programs. Many thanks to all involved in this successful venture, especially to Cuyahoga County Executive Armond Budish and District 11 County Councilwoman Sunny Simon for their support! Community Development Manager at the City of Euclid and lifelong resident.